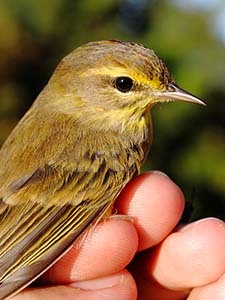 Many migratory bird species are declining in abundance. Habitat loss and fragmentation due to urban development is considered a main cause of these declines, and diversity of bird species generally declines with urban development. However, not all bird species respond similarly. Our research explores how bird species respond differently to urban development, according to shared life history traits. We studied the relationship between bird diversity and urban sprawl using spatial analyses of the U.S. Geological Survey’s Breeding Bird Survey (BBS) and National Land Cover Data (NLCD) datasets and U.S. Census population data for the Mid-Atlantic Coastal Plain. Environmental parameters representing landscape composition, landscape structure, and human population density were measured for sites at 300 meter and 1000 meter areas around BBS sub-route study sites. Landscape data was spatially related to breeding bird diversity, as measured by species richness, species evenness and bird abundance). Bird diversity was measure for bird groups identified according to migratory, dietary and habitat groups. Analyses using mixed linear models indicate that breeding bird diversity responds differently to urbanization parameters according to these life history traits. Among dietary groups, insect-eating birds demonstrated the most negative response to urban development, while birds with generalized diets demonstrated the most positive response. These results suggest that food resources are changing with urbanization, with naturally occurring food resources becoming limiting resources for some bird populations, and anthropogenic food resources augmenting others. Among migratory groups, diversity of neotropical migrants declines most dramatically with urban development. In order to understand how continued urban development will affect bird populations and related conservation efforts, future research must examine urbanization impacts in terms of life history traits and community interactions.